At a meeting of Ribbleton Lodge No 6386, the brethren saw lodge member Barry Wright celebrate 50 years in the Craft. The lodge was honoured by the presence of Assistant Provincial Grand Master David Winder, who was accompanied by Provincial Deputy Grand Director of Ceremonies Barry Fitzgerald and assistants to the Provincial Grand Director of Ceremonies Peter Littlehales and Gary Smith. Others in attendance included grand officer and Preston Group Chairman Steve Bolton, acting Provincial grand officers Mark Howard, Michael Pinckard and Peter Ledder. The lodge was also pleased to welcome Assistant Provincial Grand Master Stewart Seddon who was attending in support of the celebrant, Barry. David Winder (left) presents Barry with his celebration certificate. The lodge was opened in due form by the master Michael Grey. Following the administrative business of the lodge, Barry Fitzgerald entered to announce the presence of David Winder who duly entered, accompanied by grand and Provincial grand officers. He was warmly welcomed by Michael and David responded by thanking him and the lodge members for their warm welcome and concluded by accepting the gavel of the lodge. On taking the master’s chair, David began by congratulating the evening’s celebrant Barry Wright, on his celebration of the amazing milestone of 50 years as a Freemason. To set the scene of how long 50 years was, he reminded the brethren of some of the events that occurred all those years ago. It was a year when Rod Laver was Wimbledon Singles Champion, Enoch Powell delivered his ‘Rivers of blood’ speech, Martin Luther King was assassinated, the last steam passenger service occurred in this year, Harold Wilson was Prime Minister and Manchester United won the European Cup for the first time. Turning to the evening’s celebration, David asked Barry Fitzgerald to place the celebrant in a comfortable chair before him. He invited celebrant Barry, to relax and imagine himself sat by his fireside wearing a comfortable pair of Masonic slippers, ready to enjoy the evening to the full. Having set the scene, David began by recounting Barry’s early life living in Preston where his father was initially employed by Leyland Motors as a seat upholsterer before moving to English Electric as a semi-skilled fitter. His war service saw him in Liverpool and Manchester carrying out the harrowing duties of a fireman during those dark days for the country. He completed his war service in the Pioneer Corps with a posting to India that meant he missed Barry’s arrival into the world in 1945. On his return home, sisters for Barry duly arrived in the shape of Marlene, Jesse and four years later, Mavis Anne. Completing Barry’s family, David informed the brethren that his mother Hannah, worked as a weaver in Miller Road, Preston. Now referring his comments to Barry, David mentioned his attendance at Ribbleton Avenue Methodist Infant and Junior Schools before he completed his formal education at Ribbleton Hall Secondary Modern. Barry did say his school days were happy times with his favourite subjects being mathematics, geography and history but he hated English with a vengeance and was not too keen on the few occasions he received the cane! David moved to the sporting front, where Barry’s interests focused on cross country running and basketball and a later interest in boxing that was soon dropped when he discovered that being hit, really hurts. His other activities included involvement with St Matthew’s Church Lads’ Brigade and the Sea Scouts. Progressing to Barry’s working life, David mentioned his time as an apprentice fitter/turner at Dilworth and Carr based in Marsh Lane near to the Lido cinema, renowned for showing risqué films. As part of his training, Barry attended the then Harris College where he qualified as a turner gaining a B-Tec at the first, second and third levels. Unfortunately, on achieving those levels the company would no longer pay for Barry’s studies and on the passing of his father, Barry became the main household bread winner, meaning, further study was out of the question. These were hard times with Barry’s mother having three jobs, two in corner shops, serving and cleaning, and the best one of all, working in the local chippy where six ‘penn’orth’ of chips could be supplemented with free batter scraps. Changing the subject to romance, David, detailed Barry’s first encounter with Linda Routledge when, at the age of 19, he was in a self-confessed happy stupor whilst hunting in the ‘Top Rank Club’. It was an encounter that led to courtship and finally marriage in June 1967 at the United Reformed Church, Leyland and followed by a wedding reception at Palm Court, within the confines of the original Leyland Masonic Hall. Barry recalled a two-day honeymoon spent at the Old England Hotel, Windermere. On receiving the bill, Barry thought he had not only paid for the accommodation but had also bought shares in the hotel! Some four years later the marriage was blessed with a son, Stuart William. Returning back to Barry’s working career, that included being made redundant at the age of 27, David was pleased to say he soon found another job as a tool setting foreman at Butec, Leyland. On this occasion he was responsible for managing six lady employees who operated 13 machines. It was here that he quickly learnt the difference between Mars and Venus. Four years later, Barry moved to Goss International where he was employed for the next 20 years until redundancy again saw him out of work once more. However, on this occasion, fate played a part and David was pleased to say that a chance conversation with fellow Mason, Doug Little, resulted in Barry taking his job, he having retired on the same day. It was a simple matter of Doug retiring on the Friday and Barry commencing work, now as a representative for Speedwell Tools, the following Monday. As Barry reached his 65th year, with perfect timing, the company ceased trading and Barry retreated into the distance and into enjoyable retirement. David went on to mention Barry’s growing interest in gardening, (pun intended) that resulted from the wedding present from his father-in-law, who simply stated that the gardening tools in his garage were now at Barry’s disposal. He also mentioned Barry’s love of crown green bowling, with Linda the current treasurer of the Eagle and Child Bowling Club and Barry playing the greens around five times a week; this is when his hands are not full, with a ready interest in his two grandchildren Ben and Amy. Again, changing the subject this time to Barry’s Freemasonry, David began by asking the lodge secretary Ray Beech to give a brief résumé of the minutes of the meeting at which Barry was initiated. David then turned the clock back to 1968 when Barry’s father-in-law, Raymond Routledge, a member of Ribbleton Lodge, turned to him and said: “Right you, it’s time you joined Masonry.” Up to that point, Barry’s only contact with the Craft had been to attend a Ladies’ Evening when his mother could not believe her eyes on Barry appearing, dress to kill, in a dinner suit. At that time, Ribbleton Lodge always conducted double ceremonies and 10 meetings a year with the expectation of bringing in at least six candidates per year. Following the scrutiny meeting, at which Barry was considered ‘a bit young at 22’, he was initiated on 27 May 1968, passed then raised at the following August and September meetings. David recalled Barry saying that, at that time there were about 12 to 14 stewards in the lodge with regular practices that would be considered strict by today’s standards. There was, of course, the ‘Masonic ritual’ homework after every junior practice. Continuing, David was pleased to report that Barry did survive, attaining the chair in 1982 some 14 years after his initiation. There he joined fellow masters, Syd Kenyon, Frank Cook, Derek Thompson and David Thompson in making lodge visits. Barry’s aim was to visit all 36 Preston lodges, but he only ‘managed’ 33 during his year in office, a very creditable achievement for someone who was also in full time employment. Mike Jones (right) presents Barry with his gift from the lodge. David went on to mention Barry’s work in the lodge, having served as senior warden three times, junior warden, twice and social secretary for many years. During that period, he also found time to join the Setantia Lodge of Installed Masters No 7755. His work in the lodge was recognised in 1993 when Barry was appointed to the rank of Past Provincial Assistant Grand Director of Ceremonies and subsequently promoted to Past Provincial Senior Grand Deacon in 2002. 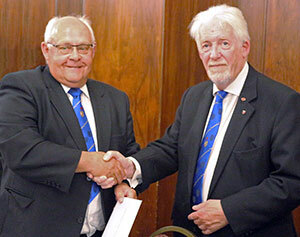 Rounding off Barry’s Masonic career, David also acknowledged his wide-ranging achievements and excellent progress in other orders within Freemasonry. He concluded his remarks by informing Barry that the Provincial Grand Master Tony Harrison, was aware of his celebration and although he could not be present in person, he had sent a personal greeting in the form of a certificate. He then invited the group chairman Steve Bolton, to read the certificate. David closed by reminding Barry that, on the day he was made a Mason, he was charged to be respectable in life, useful to mankind and an ornament to the society of which he was on that day made a member. He was under no doubt that Barry had fulfilled his obligations on every count and congratulated him on the wonderful achievement of celebrating his jubilee in Freemasonry. His final words were: “I do hope that this presentation has been accurate, accrued without bias and has left you on a good end. You will be pleased to know that although this is not a crown green bowling club, it does have licenced facilities and you will soon be able to enjoy a glass of the amber nectar! Thank you for telling me most of the truth, most of the time.” This was followed by well-deserved applause from all the brethren present. Later in the evening, as a memento of the occasion, David had the pleasure of presenting Barry with booklet containing a copy of what he had said earlier in the lodge. The celebrations continued with Mike Jones regaling the brethren with anecdotes of Barry’s time as a member of Ribbleton Lodge, particularly humorously mentioning Barry’s ‘skill’ at telling jokes. 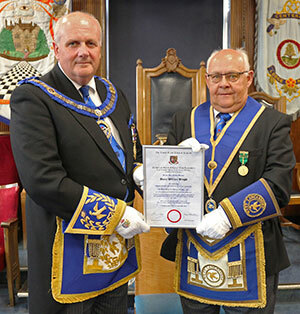 He invited the brethren to rise before proposing the toast to Barry’s health, He concluded by congratulating him on his 50 years in Masonry and on behalf of the lodge, presented him with a voucher for use at a local garden centre. In response, Barry thanked Stewart Seddon for his support in attending his celebration. Much to the amusement of the brethren he went on to provide his version of his early time in Ribbleton Lodge. Turning to David Winder, he thanked him for all his hard work in preparing for the celebration and for delivering it in such an eloquent manner. He concluded by thanking Mike Jones for the production of the excellent table plan for the occasion. Pictured from left to right, are: Gary Smith, Peter Ledder, Mark Howard, Stewart Seddon, David Winder, Barry Wright, Steve Bolton, Michael Pinckard, Peter Littlehales and Barry Fitzgerald.